Available from R J Cox Engineering , Magliner Gemini XL convertable hand trucks deliver more product in less time with less effort and provide an increase in work efficiency. With a high load capacity of 550kg as plaform truck or 225kg as handtruck Magliner Gemini XL convertable hand trucks are supplied with black platform and castor brakes. 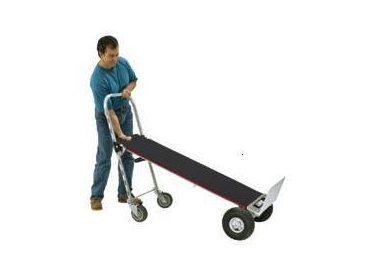 The convertable hand trucks can convert from 2 to 4 wheels, with easy change wheels that require no tools, and feature a quick connect deck with longer, wider platform area for more stable load stacking. Convertable handtrucks have a heavy duty design for superior durability and the non-skid surface increases load stability and reduces product damage.